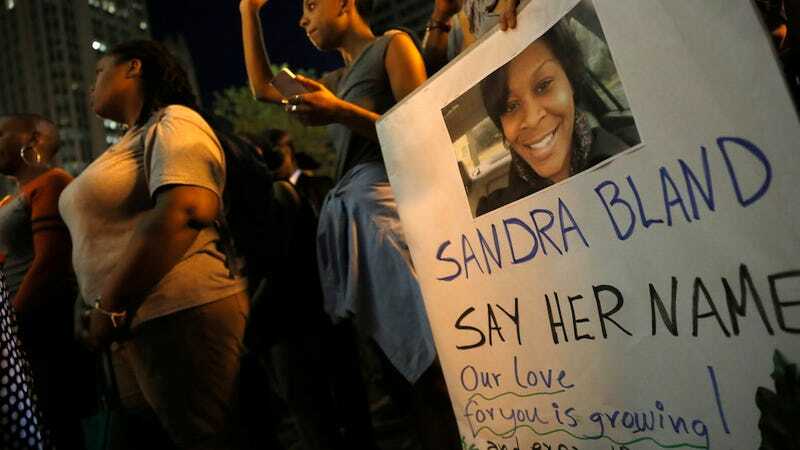 There is something very off about a recent story circulated by the Associated Press on Sandra Bland’s toxicology report, which was released on Monday. It was mostly republished by right-of-center publications like the New York Post and Fox News, with little interest from the mainstream media—presumably because the article makes some questionable claims about Bland’s marijuana use, a handy conservative talking point that is depressingly familiar. What the Associated Press and its on-call experts failed (rather egregiously) to note is that THC levels redistribute and, more importantly, quite often rise after death. There is very little literature on residual THC in dead bodies, and the literature that does exist shows that postmortem THC levels are almost impossible to pinpoint exactly. Even with living people, there is no definitive scientific consensus on what THC level constitutes impairment; the decision to set a legal driving limit based on this measurement was extremely controversial. Its presence in a toxicology report is not enough to presume impairment at the moment of death with any kind of certainty, which Dr. Goldberger—who also helped George Zimmerman’s lawyers make the claim that Trayvon Martin had enough marijuana in his system for impairment—did. While Bland’s postmortem THC levels are certainly relevant to the ongoing investigation into her death, they are absolutely not relevant to the public without appropriate context. It’s disheartening to watch Sandra Bland’s drug use become quietly, steadily politicized—the implication being, of course, that if she smoked marijuana with any kind of regularity, she deserved what happened to her.